Beautiful colors - rich and expensive looking. Everyone loves it and think it cost 5 times more than I paid. Update your bedroom with this contemporary comforter set from the Madison Park Barrett Collection. The dark, warm colors woven in a Jacquard geometric pattern lend a relaxing and comfortable style to your room. Crafted with 100-percent microfiber polyester, this comforter is machine washable and is a wonderful option for year-round comfort. 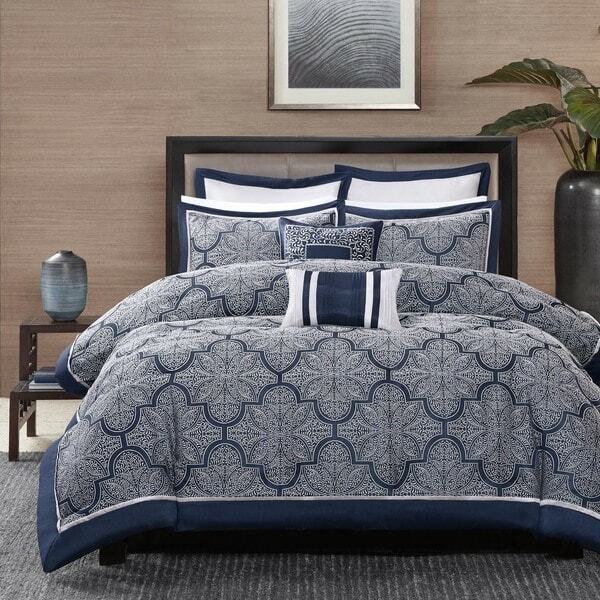 This Madison Park Barrett comforter set is exquisite! The embroidery is just perfect! The navy color is a true navy and stunning with the contrasting white embroidery. The pillows are a nice bonus! Quick Ship, received it in 3 days. I was very happy with this bedding set. The colors are exactly what you see online. The comforter is soft and snugly. The threading adds a great texture to the comforter. I hope that when I wash it the threading doesn't get too many pulls in it. Have owned for less than a month. 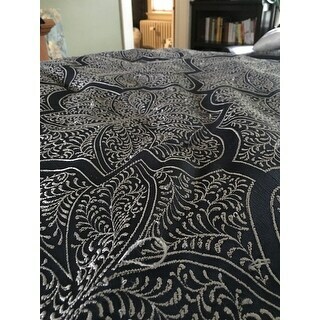 Within a week pulls appreared on comforter like previous reviews stated. If you look close at my picture you can see 5 pulls in one area. Wish I could return it. I really wanted to like this comforter but the embroidery snags so easily on anything. Fingernails, dry heels, clothing hooks, pets. My cat couldn't walk on it without getting stuck. The first few weeks, I fixed the stitching in an attempt to keep it nice but soon gave up. The more ragged the embroidery became the less comfortable it was. The underside was soft but the loose threads irritated my skin while I tried to sleep. I couldn't afford a new comforter so I kept this one for over a year. I finally ordered a new PLAIN comforter and plan to throw this one in the trash. It's too ragged to even give away. If you buy this one, keep in mind it's a high maintenance comforter. This looks great in our bedroom and I love it; however, as other reviews stated, the comforter barely covers the top mattress. Also, the detail on the comforter snags easily. My kids brought a toy in the bed and it caught the stitches on the comforter. 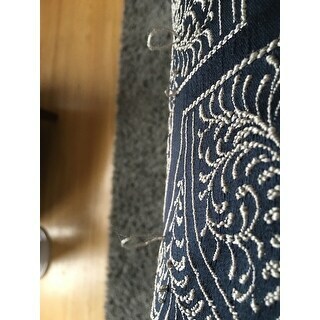 We don't have any pets, but I can imagine that nails of a pet would also easily snag the stitching detail. Wonderful comforter. The color is a rich blue, and the stitching is well done. 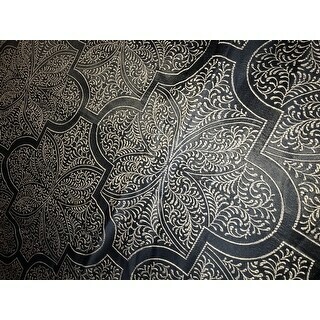 This is a great comforter and looks luxurious, But it is a much darker comforter than shown in the picture! 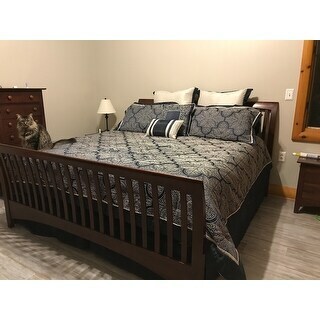 I ordered a Cali king to make sure that it fit my king sized bed since I've noticed that most people say the comforters they've ordered are smaller. 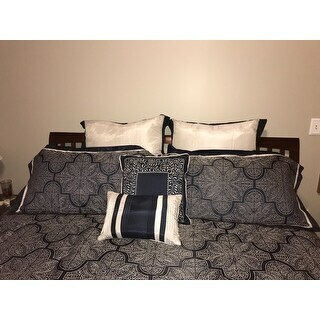 Love this comforter set; goes well in navy/gray color scheme; very good value. Exactly as pictured. Looks great on the bed. Great price, looks expensive! Defines my bedroom! Amazing navy, white, gray set really sets the stage for my MBR. The furniture store I bought my bed at actually had it on their floor model. Very pretty, just snags very easily. Good price for the set. I have purchased this brand before and have always been pleased!!!! Love this set. Looks very elegant. This was WAY more beautiful than I had expected. It isn't really hot. I don't like the white shams but love everything else. I am extremely careful with it, as the reviews above warn about the white stitching . That stitching is what makes it look very , very nice. "Is the material shiny and does it snag easily?" "What are the dimensions on the euro shams?" The dimensions are as follows: Queen size duvet cover is approximately 90 inches long x 90 inches wide, sham is 20 inches wide x 26 inches long, dust Ruffle/Bed Skirt is 15 inches high x 60 inches wide x 80 inches long. The King Size duvet cover is approximately 92 inches wide x 104 inches long, the sham is 20 inches wide x 36 inches long, dust Ruffle/Bed Skirt is 15 inches high x 78 inches wide x 80 inches long. The California King Size Duvet Cover/Comforter is approximately 92 inches wide x 104 inches long, sham is 20 inches wide x 36 inches long, the Dust Ruffle/Bed Skirt is 15 inches high x 72 inches wide x 84 inches long. The decorative pillows are 18 inches high x 18 inches wide, 12 inches high x 18 inches wide. the Euro shame is approximately 26 inches wide x 26 inches long. "Is the king and the california king the same dimensions?" Hello comforter needed, the comforter dimension for King and Cal King is the same. The difference is the bedskirt as the Cal King is wider and shorter in length. Have a great day! "Do you have a california king size comforter in this pattern?" Hello marilyn1944, you can choose Cal King from the drop down options menu to purchase this comforter set in a California King size. Thanks for shopping with us! "Hello, What are the dimensions of the King size comforter? What are the dimensions of the shams and euro shams? Thanks"
Hello milhul, the king comforter measures 104 inches wide x 92 inches high. The king shams measure 20 inches high x 36 inches wide. The euro shams measure 26 inches square. All measurements are approximate. Thanks for shopping with us! "WHEN WILL THE NAVY BE BACK IN STOCK"
Hello JANAIGIANNI, items are restocked as they become available; however, we cannot guarantee an item will be restocked. Thank you for shopping with us. "What color is the light color on the Black comforter? It looks cream or ecru? However see the Blue one has grey. Is it the same as the blue comforter or a warmer color?" Hello monique S., it is ecru or beige. Have a great day!